Anyone seeking a lesson in the perils of over-design can start with the almost-fine prison break puzzler BailOutBob. Militaristic prison lockdown stereotypes set up a dangerous environment ready for some applied critical thinking; BailOutBob spoils the opportunity by indulging too deeply in its potential. The game stars BoB, an inmate who posted bail but somehow ended up lost within an unreasonably secure prison. You offer a guiding hand for his escape. BoB’s biggest threats are security cameras, and most of your help across the game’s forty rooms involves ushering him around their field of vision. The bulk of BoB’s problems can be solved by pushing fake hallways in front of cameras to fool security – an absolutely ludicrous solution but one that makes internal sense in a Road Runner-y cartoon nonsense logic way. BoB also has to contend with bottomless pits, which can be covered with planks, or to sneak around by blowing holes in walls with bombs. This is all standard puzzling fare, and BailOutBob does best when playing with these tired-and-true ideas. 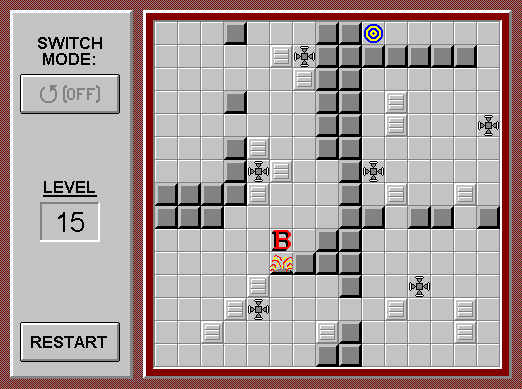 The fifteenth level offers a great example of that with a tight, Sokoban-inspired challenge based on these staples. Then, sadly, a few too many complicated ideas cloud those more effective puzzle elements. 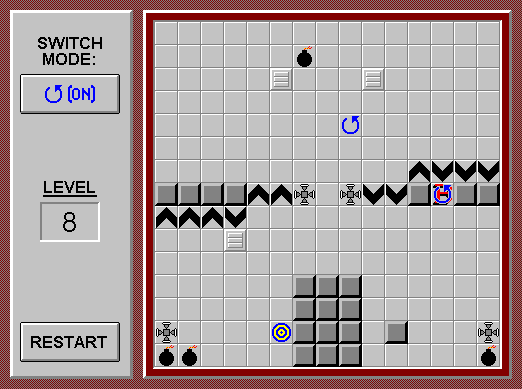 Throughout the game, BoB has to move though one-way passageways (though you can sidestep through them as well). These passages can be reversed with “switches,” which you can toggle on and off to walk through one-way passages without affecting them. This mechanic works as inelegantly as described. It adds a wholly unneeded layer to a game already filled with obstacles. Some levels also include hidden areas, invisible teleporters, and other gimmicks that only confuse. 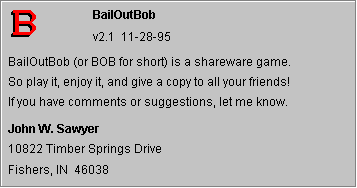 BailOutBob doesn’t require or warrant that much complexity. The parts with bombs, planks, and fake hallways at least amount to silly prison break game – slight, but cohesive. Everything atop that subtracts from whatever simple interest it achieved. In an dark, abrupt twist ending, BailOutBob reveals that BoB lied to you about his situation: he was actually “a very dangerous criminal,” and for your transgression, you are locked in the same prison he just escaped from. The game repeats in a cycle, forever.